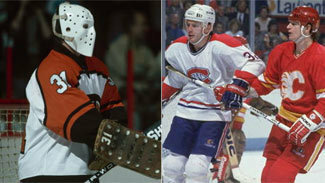 In the ninth installment of our series on the NHL in the 1980s, we focus on the 1987-88 season. It was a year when fans were kick-started into playoff mode in the late summer with the Canada Cup tournament, an elite best-on-best international showdown. That was quickly followed by an NHL season that featured a scoring race between Wayne Gretzky and Mario Lemieux as well as several history-making and totally unexpected moments. Here’s a look back at some of the headlines and personalities that kept fans on the edge of their seats in ’87-88. The 1987 Canada Cup -- contested from Aug. 28 through Sept. 15 -- proved to be one of the most memorable international tournaments of all time. It marked the only time Gretzky and Lemieux skated on the same side in a meaningful competition during their remarkable careers. And Canada’s megastar combo didn’t disappoint. Working on the same line, they combined for nearly 30 percent of the club’s offensive production. After a five-game round-robin schedule, Canada, Sweden, Czechoslovakia and the Soviet Union advanced to a one-game-elimination semifinal round. The Canadians and Soviets moved on to the best-of-3 final with victories over the Czechs and Swedes, respectively. The Canada-USSR final series -- considered by many experts to be among the most thrilling hockey competitions ever -- went the distance, featuring a pair of overtime games and wild swings of momentum, with each of the three games decided by a 6-5 score. The Soviets took the first game on an overtime goal by Alexander Semak at the Montreal Forum. Canada bounced back with a double-OT win at Copps Coliseum in Hamilton on a goal by Lemieux, assisted by Gretzky (Lemieux had three goals, and Gretzky piled up five assists). In the finale, also played in Hamilton, the Soviets raced out to a 3-0 lead in the first eight minutes of action only to see Canada scramble to a 5-4 edge by the end of the second period. Semak would tie the game at 12:21 of the third period, setting up the historic finish. With 1:26 left, Lemieux scored the winner, taking a pass from Gretzky and ripping a laser over the left glove hand of Soviet goaltender Sergei Mylnikov. The game-winning play, the culmination of a 3-on-1 rush (Lemieux, Gretzky and Larry Murphy against 21-year-old Soviet defenseman Igor Kravchuk) that started from a defensive zone faceoff, was aided by an uncalled neutral zone hook by Dale Hawerchuk on back-checking Soviet center Vyacheslav Bykov. To be fair, the series featured many uncalled stick or interference fouls on both sides. Gretzky earned MVP with a tournament-best 21 points (18 assists). Lemieux scored a tourney-high 11 goals in the nine games. Sergei Makarov led the Soviets with seven goals and 15 points. On Dec. 8, in a game against the Boston Bruins, Ron Hextall of the Philadelphia Flyers did something no other NHL goalie had ever done: He scored a goal by shooting the puck into the net. Trailing 4-2, the Bruins pulled goaltender Reggie Lemelin. With an open target, Hextall flipped the puck over the six Bruins skaters, landing it in the offensive zone en route to the net. During the early stages of his 13-year NHL career, Hextall would change the game dramatically with his ability to leave his crease and handle the puck effectively. His play inspired young goaltenders to develop their puck-handling skills. Hextall stands among five NHL goaltenders (Chris Osgood, Martin Brodeur, Jose Theodore and Evgeni Nabokov) to have scored a goal by shooting the puck into the net. Prior to Hextall’s goal, Billy Smith of the New York Islanders had been the only goalie in League history credited with a goal. In a game against the Colorado Rockies on Nov. 28, 1979, Smith was the last opposing player to touch a puck that was shot into an empty net by a Rockies player during a delayed penalty. Smith did not shoot the puck into the goal. Despite finishing the regular season second to the Calgary Flames in the Smythe Division, the Edmonton Oilers cruised to their second straight Stanley Cup and fourth in five seasons. The Oilers opened their title defense with a five-game series win over the Winnipeg Jets before a Smythe final showdown against the archrival Flames. Two years earlier, Calgary knocked Edmonton off its championship perch in a seven-game series. This time, the Oilers were having none of it. Gretzky and Co. sent their provincial rivals packing with a four-game sweep. Gretzky’s short-handed OT winner in Game 2 at Calgary’s Saddledome turned the series in the Oilers’ favor. In the Campbell Conference final, Edmonton brushed off the pesky Detroit Red Wings in five games to advance to its fifth Stanley Cup Final in six years. There the Oilers were matched against the Bruins, who were led by defenseman Ray Bourque and goal-scoring winger Rick Middleton. In the end, the Bruins were no match for the mighty Oilers, who swept their way to another title, raising the Cup with a 6-3 win on May 26 in front of a thrilled home crowd at Northlands Coliseum. The Oilers weren’t originally scheduled to play host to the fourth game of the Final. That changed when a power failure in the Boston Garden during the “first” Game 4 of the series caused the game to be cancelled with the score tied, 3-3, at 16:37 of the second period. Earlier during the sweltering evening, a fog arose from the ice surface, interfering with play. Once the power failure hit the building, the League suspended the game, eventually deciding to replay it from the start in Edmonton. The League did keep the records from the suspended game, however. That why Glenn Anderson’s goal for Edmonton at the 10-second mark of the first period still stands as the record for the fastest goal scored from the start of a Cup Final game. Two years later, in the 1990 Cup Final, Bruins forward John Byce tied the record with a goal at the start of Game 3 against the Oilers. While the Oilers were celebrating their Cup victory, there was no one in the crowd who was thinking they had witnessed Gretzky’s final game with Edmonton. But that was the case -- the Great One would be traded to the Los Angeles Kings less than three months later. In that light, it’s fitting Gretzky was credited with the Cup-clinching goal. He also received his second Conn Smythe trophy, leading all playoff scorers with 43 points, and set a single-season playoff record with 31 assists, including a Cup Final record 10. Gretzky, hampered by injuries that limited him to 64 regular-season games, lost his lock on the Art Ross and Hart trophies. Coming into the ’87-88 season, he’d won the Hart eight consecutive years and the Art Ross seven straight times. Not surprisingly, Lemieux was the man to end Gretzky’s record run. 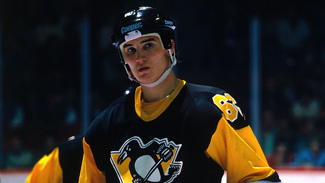 Playing in 13 more games (77), Lemieux put up 168 points to win the scoring race by 19 points over Gretzky. The Magnificent One had a league-best 70 goals. In the Hart balloting, Lemieux outdistanced Edmonton goalie Grant Fuhr to earn the first of his three MVP trophies. Despite Lemieux’s heroics, the improved Penguins finished last in the very competitive Patrick Division, seven points behind the first-place Islanders. Lemieux would need one more year to get his Penguins to the Stanley Cup Playoffs. Future Hall of Famers Denis Potvin and Clarke Gillies, who were key pieces of an Islanders’ dynasty that won four straight Stanley Cups and a North American pro sports record 19 consecutive playoff series, would play their final games during the ’87-88 season. Potvin, who played his entire 15-season career with the Islanders, skated into the sunset as the League’s all-time leader among defenseman with 310 goals, 742 assists and 1,052 penalty minutes. He also left the game as the leader in playoff goals (56), assists (108) and points (164) by a defenseman. Not bad, eh? Gillies, who played his final two seasons for the Buffalo Sabres, left his mark as one of the game’s most feared power forwards. He finished a 14-year career with 697 points and 1,023 penalty minutes in 958 games. An important postseason contributor for the Islanders, Gillies had 47 goals, 47 assists (94 points) and 287 PIMs in 164 career playoff games. With the first selection at the 1987 NHL Draft (held at Detroit’s Joe Louis Arena), the Sabres selected Quebec Major Junior Hockey League center Pierre Turgeon, who put up 69 goals and 154 points in 58 games for the Granby Bisons. With the second choice, the New Jersey Devils took Ontario Hockey League power forward Brendan Shanahan, who scored 39 goals and 92 points while compiling 128 PIMs during 56 games for the London Knights. Turgeon and Shanahan each would score more than 1,300 points during long NHL careers. Shanahan would eventually land in Detroit, helping the Red Wings to three Stanley Cups. In the end, the Quebec Nordiques probably made the best choice, selecting Western Hockey League center Joe Sakic at No. 15. Sakic would play his entire Hall of Fame career with the Nordiques/Colorado Avalanche organization, helping the franchise win a pair of Stanley Cups. The Kansas City Scouts/Colorado Rockies/New Jersey Devils franchise hadn’t done much since entering the NHL in 1974. In fact, it qualified for the Stanley Cup Playoffs once in that time (in the 1977-78 season, the Rockies were swept by the Flyers in a best-of-3 first-round series). However, the franchise had taken a turn for the better when it hired Providence College athletic director Lou Lamoriello as general manager on April 30, 1987. Under Lamoriello, the Devils earned a playoff spot with an overtime win (on a goal scored by John MacLean) over the Chicago Blackhawks on the final night of the regular season. The Devils carried that momentum into the postseason under coach Jim Schoenfeld, who replaced Doug Carpenter midway through the season, advancing to the Wales Conference Finals, losing to the Bruins in seven games. That series was marked by an off-ice confrontation between Schoenfeld and referee Don Koharski after Game 3 in New Jersey. Video cameras captured the incident when an enraged Schoenfeld may or may not have bumped Koharski and subsequently hurled insults at the referee in the tunnel leading to the dressing rooms. The League suspended Schoenfeld for one game, but Lamoriello appealed the suspension in the courts and got an order to stay the ruling. With Schoenfeld behind the bench for Game 4, the NHL Officials’ Association directed their members not to take the ice. After a lengthy delay, the game was played with local amateurs wearing yellow practice jerseys officiating the game. Schoenfeld eventually was forced to sit out Game 5, with Lamoriello (a former coach at Providence) taking his place. In the end, despite some sensational goaltending from Devils rookie Sean Burke, the Bruins prevailed with a 6-2 win in Game 7. The Devils’ run marked a dramatic change in the franchise’s fortunes and foreshadowed its success in the decades ahead. A three-year star at Cornell University, Joe Nieuwendyk made a smooth transition to life in the NHL, becoming the second rookie in League history to top the 50-goal mark, scoring 51 and dishing out 41 assists for the Flames. Calgary selected Nieuwendyk in the second round (No. 27) of the 1985 NHL Draft with a pick it acquired from the Minnesota North Stars. Nieuwendyk opted to leave school after his junior year to turn pro. That proved to be a wise decision. Nieuwendyk was awarded the Calder Trophy as the league’s top rookie, outdistancing Buffalo’s Ray Sheppard in the balloting.